The UTG 3-9×32 BugBuster Riflescope has been a favorite choice among many shooters and hunters. This is because of the accuracy it provides through its magnifying lens. Most of the consumers have expressed positive reviews on this particular rifle scope. Its various incredible features also further enhance its positive response among most if not all of its consumers. Some of the positive reviews expressed by consumers relate to its optics and magnifying power. Consumers really like its scope. They say that it looks great on M&P 15/22. The magnification range is perfect for a .22 scope. Users like how the optics are surprisingly sharp at its affordable price. The rifle scope can focus accurately over a range of twenty five yards. The clarity of the scope through its magnification is nothing short of perfection. For many users, the scope can zoom well at objects that are up to 80 yards. Its magnifier is great for bringing objects in close quarters much closer. The scope has a fast target acquisition that is easy to zero and holds no zero. The scope is also very durable. This has made many users to like the riflescope more. Reviewers love the affordability of this riflescope. It is relatively cheap compared to other rifle scopes and has a performance equal to a $200+ rifle scope. This rifle scope presents a great deal for your money and is worth every penny. Its powerful features more than surpass the price of the UTG. Many consumers say that they do not see any reason to spend hundreds of dollars on big name tactical scopes to shoot at the range while the Bug Buster is readily available. Reviewers love its strong platform. This riflescope comes with an innovative True Strength Platform that has a spherical structure. This structure helps control the interaction between the inner and outer tubes of the rifle scope. The platform has a unique design guarantees users precise adjustment elevation over time. The rifle scope is easy to mount on an American made AR-15 among other rifles. Reviewers have shown appreciation for its RGB Side Wheel Illumination that offers up to thirty six colors in multi-color mode. This enables users to accommodate all light and weather conditions when they are shooting. 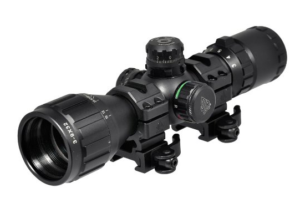 Many users like this riflescope because it utilizes an innovative EZ-TAP illumination system. They love this system because it gives them easy and convenient access to color change. Its side wheel adjustments allows the users to switch between different colors. This feature is not common for all rifle scopes and this has made the UTG 3-9X32 Bug Buster Riflescope a favorite for many. Reviewers love the reliability that UTG 3-9X32 Bug Buster Riflescope offers when mounted on their firearm because of its fog, shock and rain proof feature. This rifle scope is filled with nitrogen and is completely sealed. It is therefore very suitable for most users who find themselves in adverse weather conditions and environments because its dual red and green illumination makes this rifle scope the best choice for them. Users love it because it is resistant to all weather conditions. Consumers love this rifle because of it offers a parallax free view from three yards and beyond. The rifle scope is able to achieve an parallax view. Users prefer this rifle scope because this particular feature is not common to all rifle scopes in the market. On top of that, it is also quite impressive of the UTG 3-9X32 Bug Buster Riflescope. Reviewers like the UTG Bug Buster because it comes with scope rings. The rings are QD (Quick Detach) therefore enabling users sure and easy mounting. This rifle scope also comes with a set of flip up lens caps and optional sun shades that help consumers reduce glare. In summary, the overall ratings and reviews of the UTG 3-9X32 Bug Buster Riflescope falls on the positive. This is because it has an excellent optic and is pocket friendly in terms of budgeting. Its lenses are very clear at various distances. Its fog, shock and rain proof feature is very impressive.